Today I decided would be a great day to join with Dear Beautiful Boy's Inspired linky. I have been following this linky for a while but until now haven't joined in. So I decided to test the water with my current obsession, Baby Boy's nursery! I have been scouring Pinterest for a while now, trying to find ideas for little boys. Having made Holly's nursery filled with pink butterflies, I'm not used to all these blues, greens and jungle animals! As we will be using a lot of things we bought for Holly, we are limited to colours. Her beautiful mahogany cot will be donated to the room, as will her beige and chocolate cot bumpers, which sets up our colour theme. Holly's main colour was dusky pink so I think we will replace this with a baby blue and keep it quite simple. So here are a few pictures of inspiration I have found to start our decorating journey. 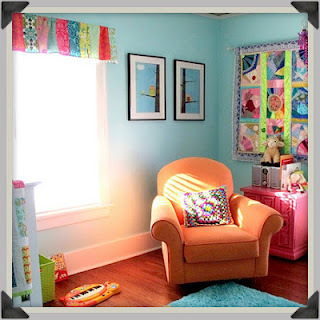 I love the quilt in this nursery and am using as an inspiration for a quilt of my own. I have loads of gorgeous dresses of Holly's that I can no longer use but am really reluctant to throw away or sell. Some of them are a bit too girly, but there are quite a few I can use. I'm really looking forward to seeing the results, I just need to find some time to do it! 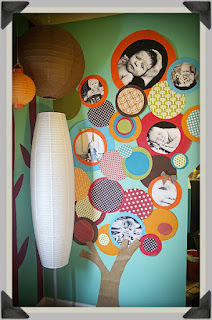 This is a really original concept for a family tree and I would love to create something like this for Baby Boy's room. 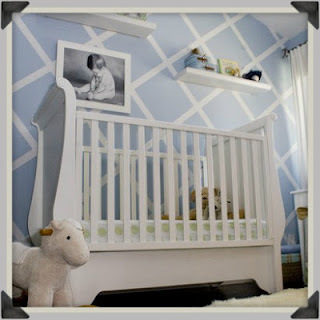 I adore stripes and the like on a feature wall and this looks great, and is exactly the shade of blue I want in the nursery. 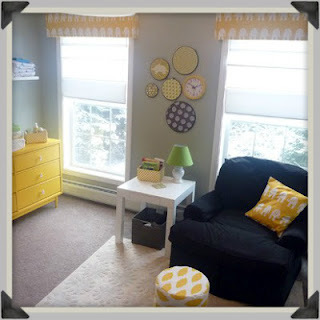 The yellow in this nursery looks great, so I should maybe consider a pop of colour. I also think the hoops look great. So there are my inspiration pictures. Head over to Dear Beautiful Boy to share your own inspirations!